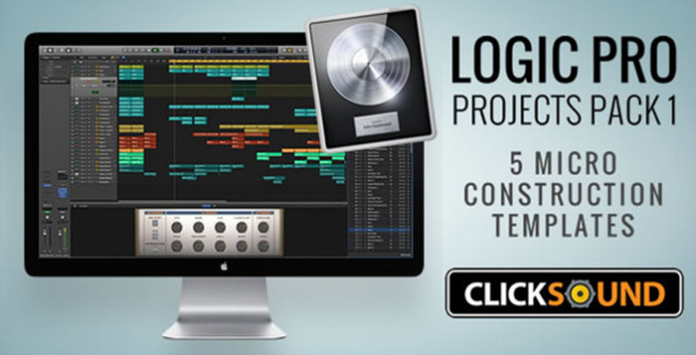 Logic Pro Projects Pack 1 is a collection of 5 mini construction templates for Logic Pro. Each mini-template is a 8-16 bar nugget of sonic inspiration designed to kick start your next project. With styles ranging from Trap to Drum & Bass, Dubstep to Hip-Hop and even some Funstep thrown in for good measure, this pack is will surely satisfy Logic’s epitite and provide you with everything you need to construct your own slamming track in Logic Pro. The great thing about all of the Clicksound MIDI Construction Templates is that all of the main elements such as drums, basslines and lead synth tracks are set up as MIDI and not bounced down as audio. This means that you can go in to each track and change any part of the structure or sound. Each MIDI track can be edited, rearranged, pitched to any key, slowed-down, sped-up, in fact you can change it in any way you want to – there are no rules and no limitations. Automation is pre-configured on the main tracks such as basslines, lead synths, pads and effects, however, you can easily get in there and change things around, tweaking to your particular taste or musical tendencies. The mastering channel for each midi templatewithin this pack takes advantage of Logic Pro’s superb built-in dynamics plug-ins such as EQ, Multiband Compression and Adaptive Limiting. This all results in a clear, loud, well-balanced and professional sounding mix. Again, you can tweak any of the settings on the mastering to fit your own sound or preferred style. Unlocking your creative genius has never been so easy with the help of Clicksound’s MIDI Construction Templates. With the lock and load simplicity of each template, plus the highest of music production standards, you will quickly be discovering your new music horizons.